Unlike the rest of the state, the Texas Gulf Coast has been working for decades to reduce dependency on groundwater because pumping has caused the land to sink. Amid a persistent drought, a growing population and a dwindling supply of surface water, much of Texas is searching for underground water resources. But a large swath of Texas — home to close to one-quarter of its population — is looking for water supplies anywhere but beneath its surface. A century of intense groundwater pumping in the fast-growing Houston metropolitan area has collapsed the layers of the Gulf Coast Aquifer, causing the land above to sink. The only solution is to stop pumping, a strategy that some areas are resisting. The geological phenomenon, unique to this part of Texas because of the makeup of the aquifer’s clay layers, is known as subsidence. Areas in and around Houston have sunk as much as 10 feet in the past 100 years, causing floods, cracking pavement and even moving geologic faults that could lead to infrastructure damage. Subsidence has long been a concern in Harris and Galveston counties, which are nearer to the Gulf and more prone to flooding. Spurred by state lawmakers in the 1970s, the counties have worked to reduce their groundwater dependency to 25 percent from more than 50 percent. That number will continue to fall as they increase their reliance on rivers like the Trinity and San Jacinto, as well as planned reservoirs. Neighboring Fort Bend County, on the other hand, which still relies on the Gulf Coast Aquifer for 60 percent of its water, is farther inland, and the effects of subsidence can be less tangible. In Fort Bend County, unlike Houston, “there isn’t a ship channel to walk to,” he said. Now that the county is starting to grow, in part because of the expansion of nearby Houston, studies by the subsidence districts estimate that if nothing is done, parts of Fort Bend County will sink about five feet in the next four decades. The impact could be lessened to just two feet under recent regulations that ask certain areas to convert 60 percent of their groundwater supplies by 2025. Not everyone agrees with the approach. Some towns dislike the rules that force them to find alternative water supplies. They are worried about the high cost of conversion and unsure whether their own land is actually sinking. Vela pointed out that subsidence in the county has affected some areas more than others. For instance, the land has sunk nearly a foot in 15 years just a few miles to the east of Richmond, in booming Sugar Land. But in Richmond itself, the ground has lowered less than three inches — although the Fort Bend subsidence district warns that could change if its outlying areas continue to grow as they have in recent years. Alternative water supplies have been difficult to find, Vela said. About five years ago, Richmond and a neighboring town, Rosenberg, secured a long-term contract to take water from the Brazos River, with plans to build a water treatment plant. But then the area was hit by drought, and the river’s flows were at their lowest in 2009. Towns were then besieged with requests from industrial and other water users to buy the newly acquired water. Recently, a company called Electro Purification approached the towns with a different solution: The company would drill wells on the other side of the Fort Bend County line. In other words, they would continue pumping groundwater from the same clay-based aquifer but outside the jurisdiction of the subsidence districts. The proposal drew outrage, with residents submitting hundreds of public comments questioning its effect on water levels in the aquifer and on subsidence. According to studies by the Fort Bend district, the wells could cause the ground to sink an additional two feet in some parts of the county and potentially cause sinking in nearby counties. But those numbers have been disputed. Gershon said the company was willing to change its proposal based on subsidence concerns. “We want to make sure that our scientists, and we think we have good scientists — that they’re getting it right,” he said. The case has been referred to an administrative law judge, who will hear arguments next year on whether the wells should be allowed. 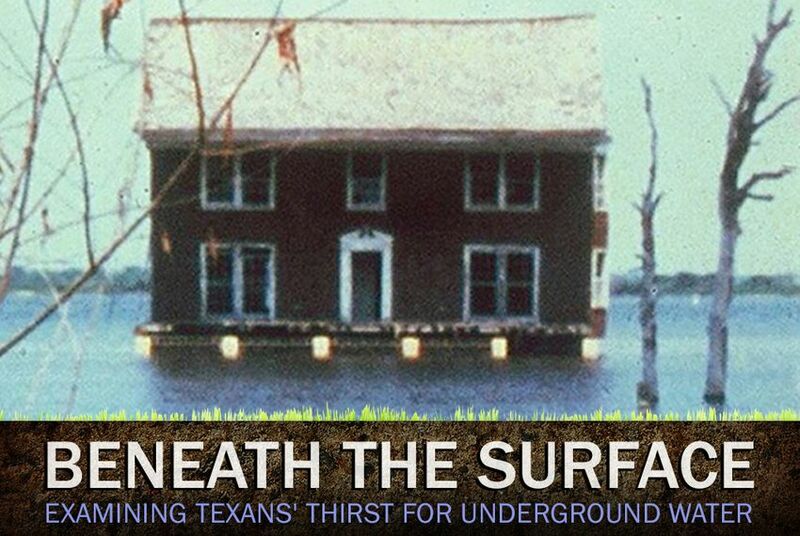 In the meantime, the Fort Bend Subsidence District is weighing its options. While it cannot prevent the drilling of wells outside its borders, the district could refuse to accept Richmond and Rosenberg’s plan for finding alternative water supplies. While some areas of Fort Bend County are sure to see more subsidence than others, based on population density, everyone must pitch in to reduce the problem, Ellis said.